Destiny Africa, is a choir made up of a group of children from an orphanage called Kampala Children’s Centre (KCC)in Uganda. Kampala Children’s Centre was originally set up in 2005 , giving a home and voice to vulnerable children in the country. This excellent video called “The Story so Far” summaries what Destiny Africa Children’s choir is all about and about their journey so far. The choir began performing at public events in Uganda in 2007 and since then they have toured America and Europe. This year they are touring England, Belgium, Switzerland and Germany; performing many concerts in schools, churches and theatres - and even at Wembley! Their concert features a lively mix of contemporary and traditional song, dance and drumming as well as gripping stories of transformed lives. Destiny Africa 'Rhythms of Life' Tour (2011) from Destiny Africa Children's Choir on Vimeo. 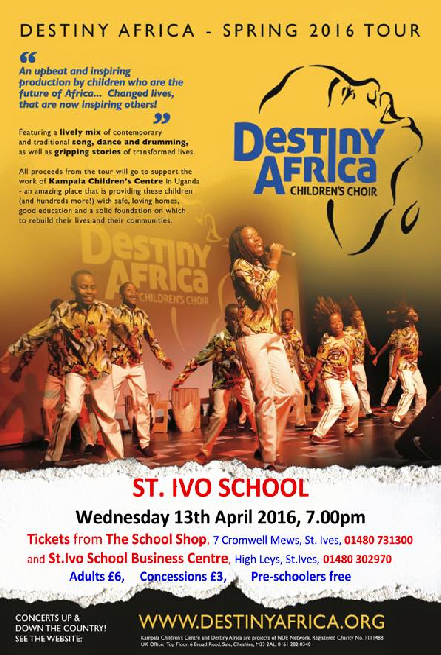 We were very pleased to have hosted Destiny Africa for a special concert at St Ivo School on Wednesday 13th April in the school hall as part of their European Tour. The concert was very well received - the choir had such energy and enthusiasm and by the end of the evening the entire audience were on their feet dancing! As well as the performance there was a stall selling hand made Fair Trade Ugandan artifacts and Destiny Africa merchandise. All items were carefully selected to help support many families, craftsmen and women back in Uganda. A group of Year 8 students took part in a workshop with the Children’s Choir alongside the music department providing the students with the opportunity to interact and spend the day with these children from Uganda, with a focus on music and Geography. The workshop culminated in a excellent performance by our students alongside Destiny Africa during the evening concert (as seen below). With a huge thanks to Linda Dove, S Nunn (Geography Department) and A Bell (Head of Music) for the organisation which enabled this fantastic event to take place and the EcoIvo team who provided free fairtrade tea, coffee and hot chocolate during the interval.